Through the European Observatory on Memories (EUROM), the UB Solidarity Foundation (FSUB) organises a number of activities around the 20th anniversary of the Srebrenica genocide devoted to the memory and remembrance of the facts that took place in 1995 in that town in the Balkans. The acts will be held both in Barcelona and in Sarajevo and will pay tribute to the more than 8,000 people killed in Srebrenica. The idea is to analyse the causes and consequences of the war, especially regarding the role played by the United Nations, that in 1993 declared the city as “Safe Area”, and the European Union. 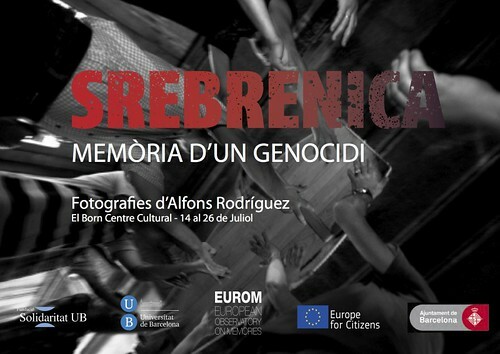 There will also be room for reflection and assessment about the different solidary actions driven from places such as Barcelona and carried out in favor of the Bosnian people, which helped to forge twinning links that still exist nowadays.In Sarajevo we count with the collaboration of our local partners, the Historical Museum of Bosnia and Hercegovina and the Foundation for Local Democracy. Moreover, all the activities are organized in cooperation with other organizations such as Districte 11- City to city Foundation, IGMAN, ICIP and the Peace and Solidarity Foundation, and supported by Barcelona City Council and the European Union. Click on the image to see the pictures album of this activity on Flickr.